This pattern was one of my first pattern buys, I loved it, I live in my jeans and this just looked perfect for wearing with them, I loved the colours and the stitch pattern. The whole thing had me so excited. Now I have lost count of the amount of attempts I have made on this, all ending in tears and never getting past about row 60 I think. Maybe there was a reason for this, one I think I have found! That reason must be that I was meant to wait to make it in woolmeise, colour Dani in dark, this is the 100% superwash merino, which comes in 150g skeins and with a fantastic yardage of 574yrds! Put that together with the lovely yarn base and the fabulous colourways and you have a dreamy yarn to knit with. Here's a closer look at the pattern and the colour of course. 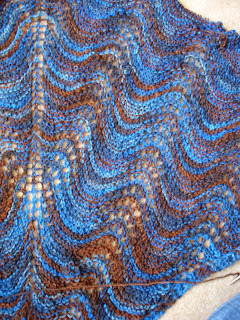 I remember using browns and blues together a lot at art school and will never forget a tutor telling how very retro and brave that was, I always thought that was such an odd statement, even more so from a tutor whose field was textiles and colour theory but hey ho, I think they are the perfect combination! 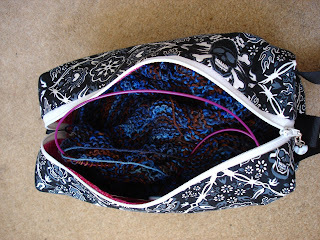 This whole project fits in my piddleee bag, that and the yarn and the chocca notions pouch, I love that I can keep it all in one place as I am terrible for losing bits of projects! 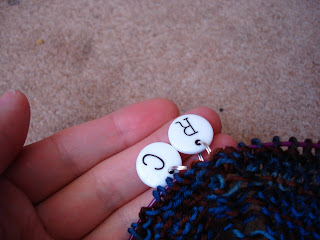 and I love these markers that came with my pouch, they have my initials heehee!!! Well it is beautiful so I am sure that is meant to be! 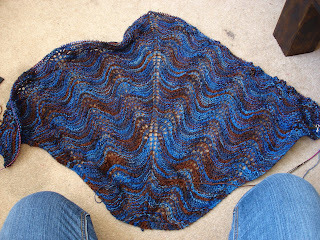 ooooh PRETTY shawl! so jealous! piddlee is just my name. piddleloop sewing team is my game. Queen of sewing rectangles i am. Right Missus, what pattern is this, where do I get it? I loooooove that shawl, and want one! it's gorgeous honey! and i have no idea what your art teacher was on about! those colours go really well together.